during the NASCAR Camping World Truck Series Fr8Auctions 250 at Talladega Superspeedway on October 13, 2018 in Talladega, Alabama. 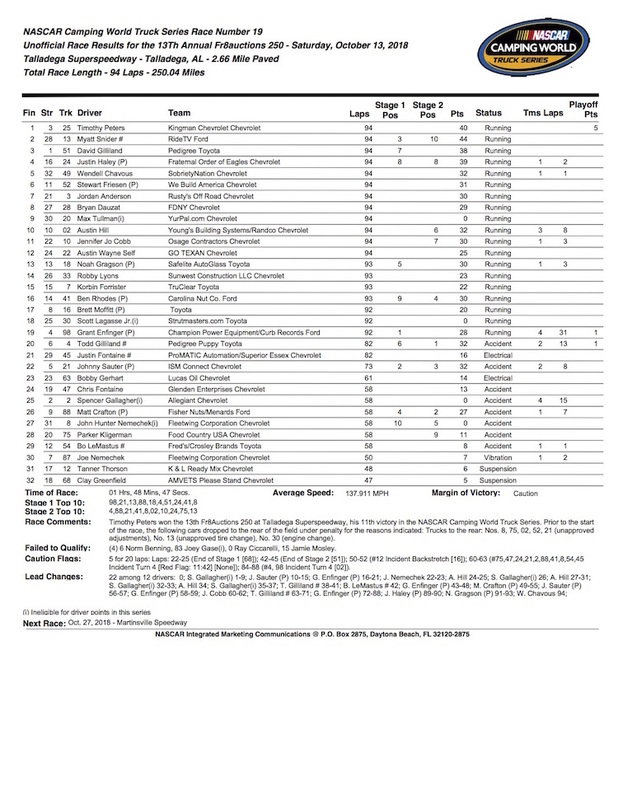 NASCAR Camping World Truck Series playoff round-two berths were on the line in the Fr8Auctions 250, the final race of the opening three-race round, Saturday at Talladega Superspeedway. 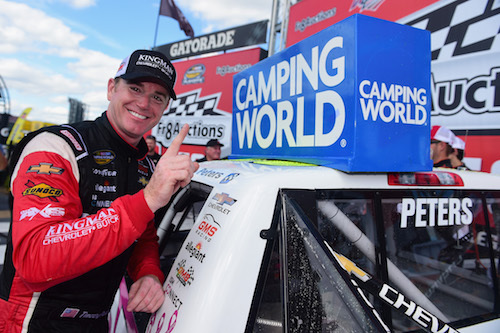 Grant Enfinger and Justin Haley already had their round-two spots clinched heading into the Talladega, courtesy of wins in the first two races of the round, leaving six drivers to battle for the final four slots. 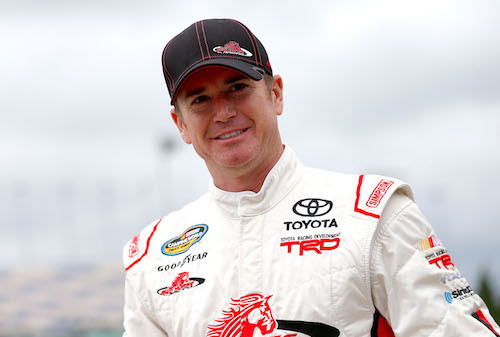 Timothy Peters played playoff spoiler at Talladega, winning the race after a last-lap crash. Peters is a veteran of the Truck Series, but since the closure of Red Horse Racing after the first five races of the 2017 season, he has raced sparingly in the series. The Talladega race was his third of a three-race deal with GMS Racing, putting him in the No. 25 truck for the three races that made up the first round of the playoffs. Saturday’s win was his second top-five in those three races. Noah Gragson and Justin Haley jockeyed the lead back and forth on the final lap of the 94-lap race before contact between Gragson and Peters sent Gragson hard into the wall. Other drivers also crashed, ending the race under caution. “You kind of can’t let up on that last lap. I hope everyone’s okay,” Peters said. “I hate to cause that, but I was going for the win; it’s my last ride. Gragson was 13th at the finish, and Haley finished fourth., the highest among playoff drivers. Myatt Snider was second and David Gilliland third. Wendell Chavous rounded out the top-five. The race-ending caution was the sixth caution of the race. All four cautions for on-track incidents came in the second half of the race, including a yellow flag with 36 laps remaining for a 10-truck wreck that involved four playoff drivers — Haley, Ben Rhodes, Matt Crafton and Johnny Sauter. All four playoff drivers advanced. Sauter already had clinched a round two spot by that point, courtesy of points earned through second and third-place finishes in each of the two 20-lap stages. Also advancing in the playoffs was Brett Moffitt. Gragson was eliminated from the playoffs, and so was Stewart Friesen, despite a sixth-place race finish. After avoiding late-race carnage, Friesen was in the top-10 at the checkered flag, despite nursing a truck with a mechanical problem through a significant portion of the race. Enfinger and Todd Gilliland were stage winners. Enfinger won the first 20-lap stage after taking the lead on lap 16. Austin Hill and Spencer Gallagher traded the lead back and forth through the second stage after restarting up front through a pit strategy of pitting late in the opening stage and staying on the race track between the first two stages. Gallagher led late in the second stage before giving up the lead to pit late in the stage and handing the lead over to Gilliland. Enfinger was back up front early in the final 54-lap stage of the race and led a race-high 31 laps. He was the leader when the yellow flag waved for the multi-truck wreck. But after a red flag for track clean-up, he was penalized for taking equipment out of his pit box when he pulled away with his gas can still attached. Enfinger was back up front by 20 laps remaining and was challenged by Todd Gilliland, and then, David Gilliland late. Todd Gilliland battled him for the lead before contact between the two sent Gilliland into the wall with 12 laps remaining. Enfinger, then, spun into the infield wall as a result of contact with David Gilliland on the restart that followed. Other top-10 finishers included Jordan Anderson in seventh, Bryan Dauzat in eighth, Max Tullman in ninth, and Hill was 10th.